These bread and butter pickles are surprisingly easy to make and are a delicious blend of sweet and salty flavors that are sure to be a hit. Do you remember the bread and butter pickles that your grandmother used to make? Well, I don’t but, if she had, I am sure this recipe is what they would have tasted like! No joke, these are absolutely delicious. I made about sixteen quarts of bread and butter pickles last year and all but two quarts are gone. The only reason those survived was because they were hidden behind some homemade dill pickles! Apparently, this delicious snack got its name during the great depression. People were eating them on bread and butter sandwiches because they couldn’t afford much else. How do you like to eat your bread and butter pickles? They are popular throughout the south and this recipe is adapted from the Mary Mac’s Tea Room Cookbook available from my affiliate. Mary Mac’s is a 65 yr old tea room in Atlanta, Ga. that offers southern cooking at its finest! It is a quaint place filled with history and many celebrities have visited leaving autographed pictures behind. Instead of giving your order to the waiter/waitress, you fill out your own menu ticket selecting from the daily menu. This was a favorite place when I attended Ga. Baptist Nursing School not only for the good food, but also because they gave a generous student discount! I love recipes that make people think you slaved in the kitchen when in reality, it was easy peasy. And, this bread and butter pickles recipe is that type of recipe! Tip: Using the food processor makes slicing the pickles a breeze but even if you don’t have one, it really does not take that long. I also use a potato peeler to peel the cucumbers which is another time saver. 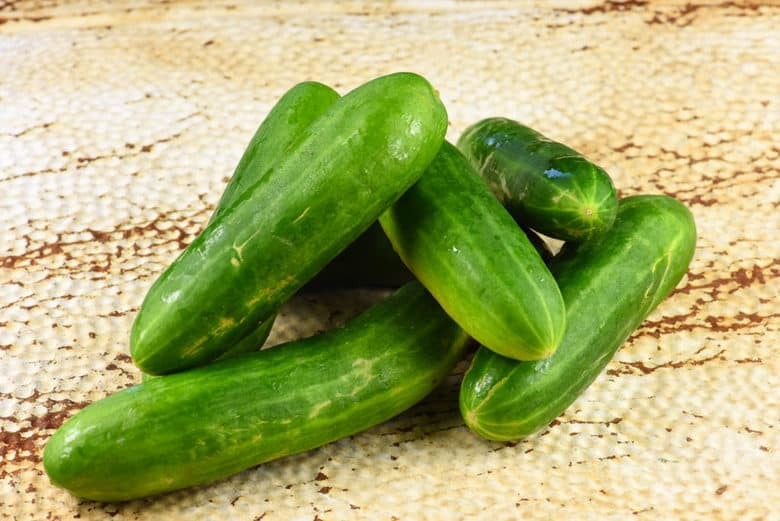 Our garden fresh cucumbers are just beginning to come in and we are enjoying cucumber sandwiches and I am going to make a lot more bread and butter pickles this year. Last year, my dill pickles turned out mushy and were honestly a big disappointment but, the bread and butter pickles made up for them! So, if you have a never fail dill pickle recipe, please share it with me! If you’ve tried these bread and butter pickles or any other recipe on Cultured Palate please take a minute to rate the recipe and leave a comment letting me know how you liked it. I love hearing from you! You can also FOLLOW ME on PINTEREST, FACEBOOK, INSTAGRAM, YouTube and TWITTER. Great for preserving your garden bounty, and you'll love the fresh flavor. Thinly slice the cucumbers. Place in a large pot. Add the onions and 2 Tbsp salt and toss to combine. Let stand for 3 hrs. Drain the cucumber mixture and rinse twice. Combine the vinegar, sugar, spices and 1/2 c. salt in a large heavy saucepan - bring to a boil over medium-high heat. Add the cucumber mixture and return to a boil. Pack the veggies and pour the hot liquid into clean, hot, sterile glass jars leaving 1/4 inch headspace. Top with the lids and rings and process for 10 minutes in a boiling water bath. Let the jars sit for one week before opening. Pickles will keep for a year. Tip: Using the food processor makes slicing the pickles a breeze but even if you don't have one, it really does not take that long. I also use a potato peeler to peel the cucumbers which is another time saver. I’m not sure if this holds true for vinegar dill pickles, but when fermenting them, it helps to keep them crisp if you remove a thin slice of the blossom end. It contains enzymes that make the pickle mushy. Adding a leaf containing tannins helps too. You have an abundance of those, your grape leaves! Thanks, Gay, I appreciate your suggestions and will have to try that! I love bread and butter pickles! I tried to make some years ago, but they weren’t very crunchy. I was trying to make them like Bubbies bread and butter pickles- they are so good and stay really crisp. Maybe I should give it another go. Rhianon, let me know if you do! Our family really enjoys them! This looks like a pretty good recipe! The other comment that mentions keeping pickles crisp is interesting! I’ve heard using grape leaves or bay leaves during the pickling process can keep a great crunch on the pickles when it comes time to pop them open and try them! I don’t know the science behind it but I have seen it in a few recipes and want to try it myself! Thanks for your recipe! Billy, thanks for taking the time to comment. I have also read about using the grape leaves to keep them crunchy and with the vineyard, we certainly have a lot of them!!! I love bread and butter pickles, I’ll need to try this recipe this year!